Poll: Do you support the overall idea? Poll: Which levels do you support? Poll: Is this too much to add? bottom left corner of this post. Thank you! Second of all, I want to say that this would be optional, you could have the "old" world type and the "extended" world type. It might also be interesting to see the player select the levels they want in world settings, because this is a mouthful. Third, I made this suggestion without ever knowing or seeing the "cubic chunks" suggestion. This increases world height too, but also increases world variety. 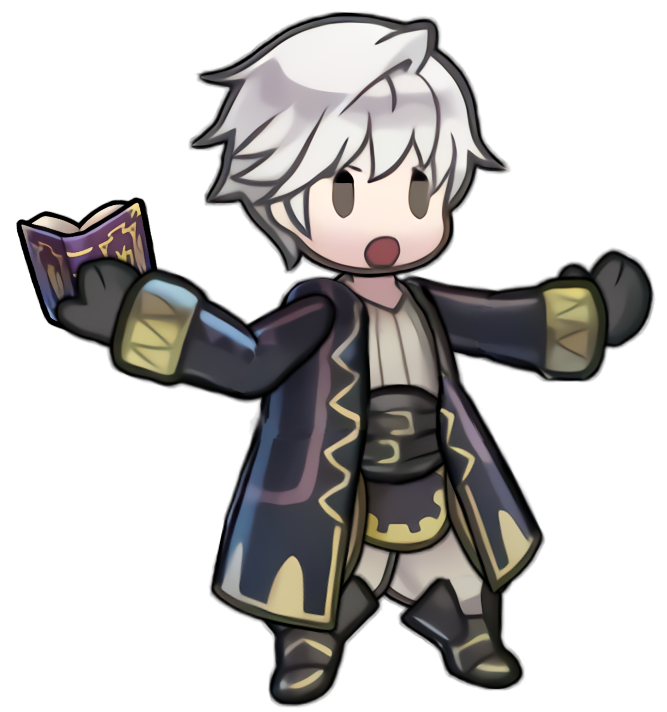 Fourth, people here don't seem to know how to read. Right below this, there's an explanation HOW THIS DOES NOT LAG. No matter how much I tell people this, they don't even listen. READ THE ENTIRE POST. Finally, I know that this idea might not be realistic. On the other hand, I do want people to support the idea and continue to polish a mod of this. One fun thing to see would be an adventure map. 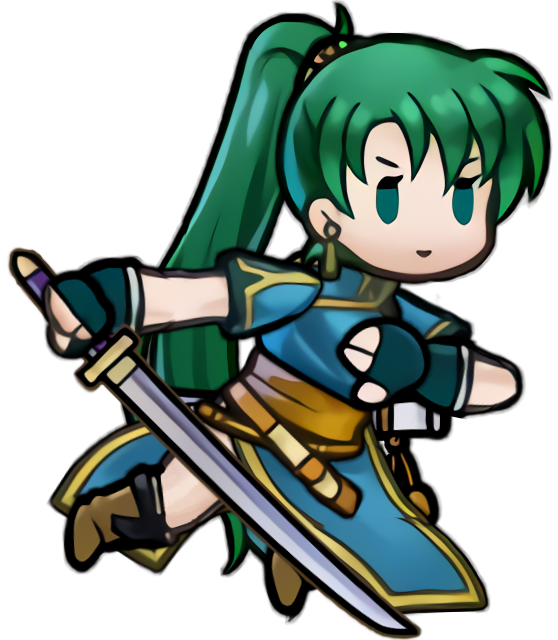 Because of this, I want to put this idea on the mod suggestions page. 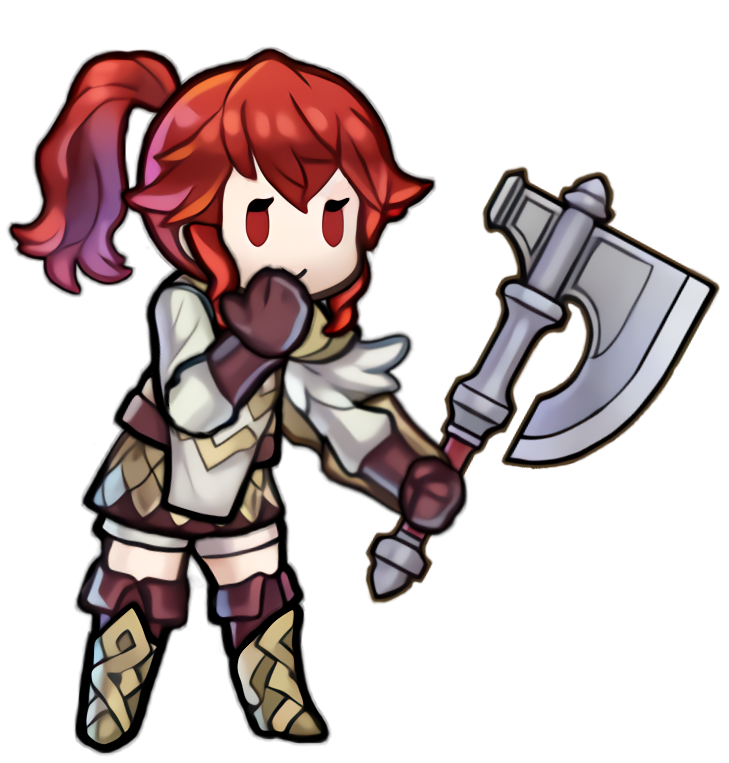 But, if for some reason this could be added, I'll keep it here. Now I know what you might be thinking. Chunks are loaded in the x and z direction, and are actually 256 blocks high. This would cause major lag, wouldn't it? My proposal is to have each layer load separately, with portals between each layer, meaning occasional portals on the ceiling and floor. The largest layer is in fact only around 256 blocks, and the other layers won't be loaded at the time. This might even cause high performance on small layers that only have around 75 blocks. These portals would be a 3x3 area going straight down, and would about every 10 or so chunks. You might know what this is. It's the normal surface, duh. No changes there. This is also a level you should be familiar with. The caves haven't really started yet, but there should be plenty of iron and coal lying around. This is usually around level 20 or 30. 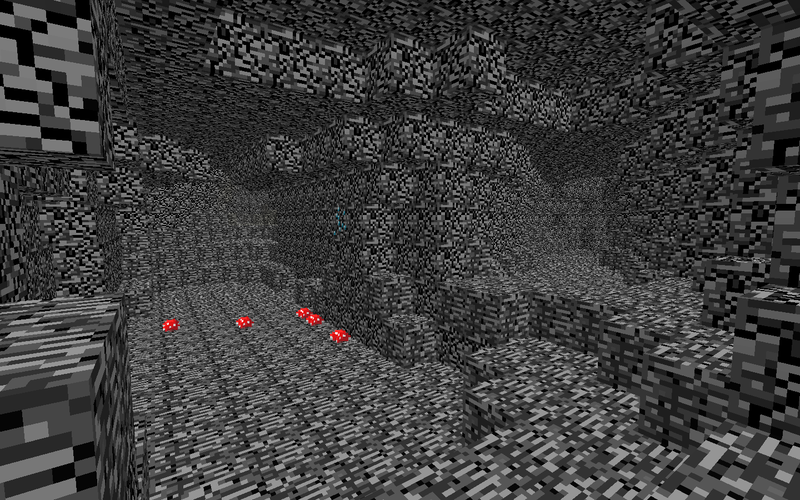 This is before some of the rare ores start appearing, and there are monsters swarming the place. This is the last level you're familiar with. This is around where you get all the diamonds, lapis, redstone, emeralds, gold, etc. At this point, you have to jump through a portal to the next level. This is where things get interesting. There are giant drop offs that go down hundreds of blocks. 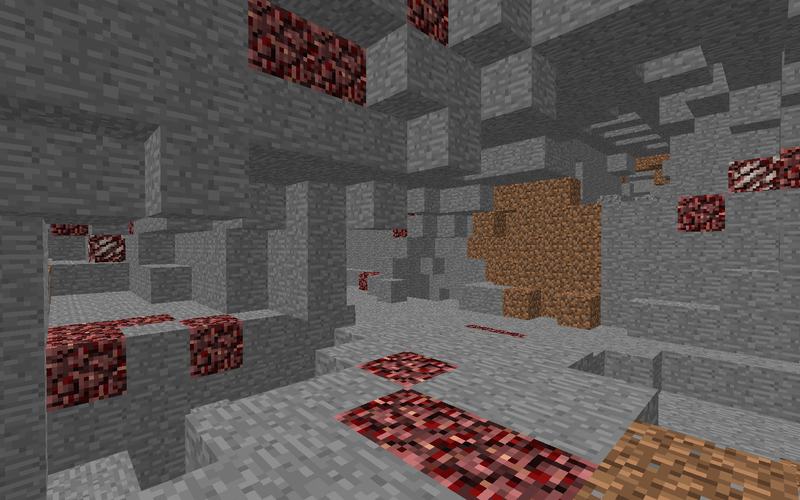 Lava would be flowing down the side of these, and ores from the rare ore level may be found in the rock. You would spawn on an area near the edge of the drop. The rock that makes up this drop is mostly stone. There might be huge stalactites hanging from the ceiling, also made out of stone. 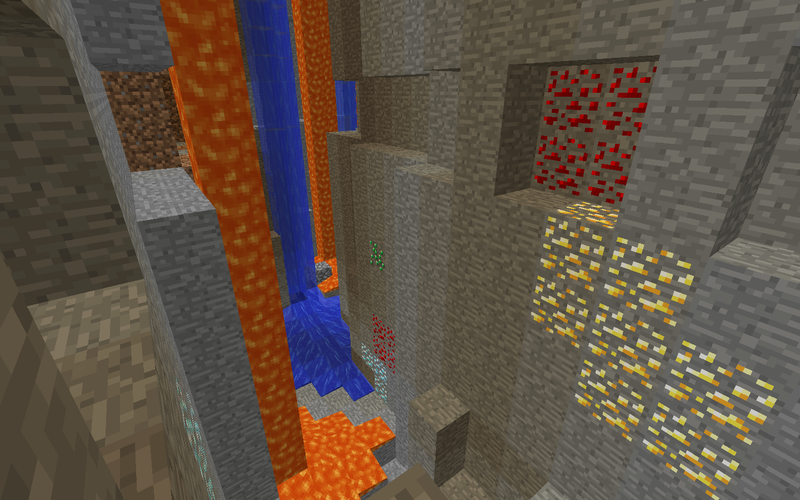 As the drop continues, there is less lapis and redstone, but more metals like gold, diamond and emerald. These drops continue for 200 or so blocks. This level is basically a huge maze of caves. It doesn't look like a maze, but it is one, winding, dead ending, and constantly forking off. Ores like gold, diamond, and emerald continue to appear, but appear rarely. This level also contains some new materials, such as acanthite ore, which becomes silver ingot when smelted. This cannot be used for any type of tools or armor, but is very valuable for villagers in trade, and can also be smelted from its ingot form into silver dust. Silver is a very conductive material. It will work like redstone, but will travel for 25 blocks instead of 15. Silver dust can also be used in potions to make a potion of cloaking, which make you invisible to mobs, but not to other players. This dust can also be a rare drop from iron golems. This level winds down for another 200 blocks, before you arrive at a portal. Sapphire is an interesting block. Besides its value in trade, it can be crafted with nine into a sapphire block, which is purely for decoration. Sapphire can also be used in enchanting. Combine a book with sapphire crystal in an anvil and you get a random enchantement (Mostly low level enchants, no OP enchants). Sapphire is also fairly rare. For every 10 redstone, there is one sapphire ore. Despite being mostly useless, aquamarine has interesting water powers. When crafted with nine aquamarine crystals, you get an aquamarine block. This block is helpful with plants, and plants grow faster when close to it. It isn't too hard to find, about as rare as gold. This crystal is considered to be a crystal of greed. It's a mix of shiny purple and orange. It's easy to spot in a cave. Villagers will go to ridiculous extent to obtain these in trade. When in block form, mobs of all types will be attracted to it. 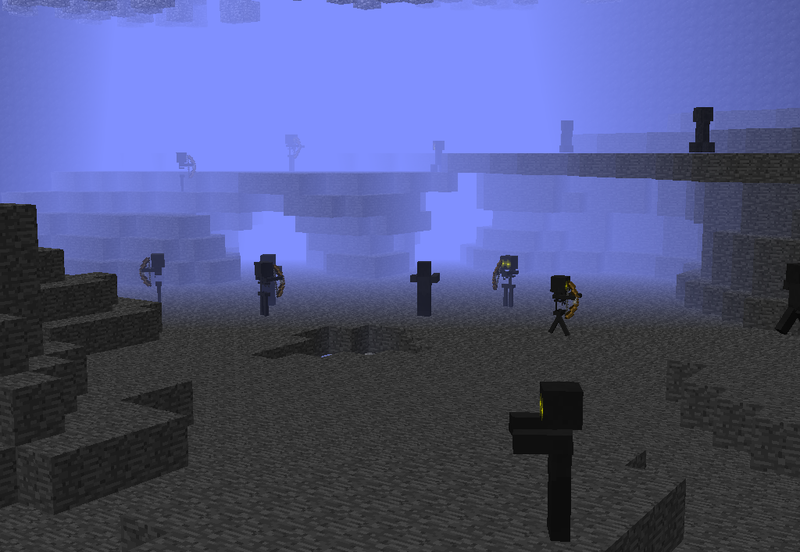 Cave mobs, such as skeletons, creepers, and zombies, will have glowing purple eyes while seeing this block. It can also be put on the end of pickaxes to make them mine faster than usual. These are called ametrine tipped pickaxes. To craft it, you need your pickaxe of choice with one ametrine crystal on either side. This ametrine is very rare. For every 10 diamonds, there is one ametrine crystal. This level is full of gaping ravines, and is the level of most value to the player. 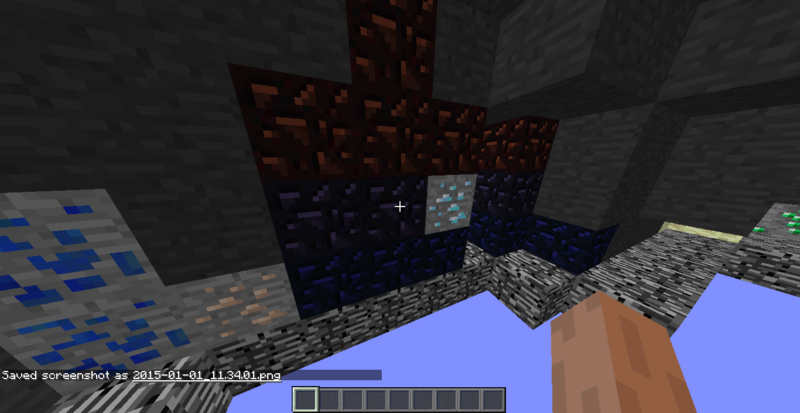 Here, the ores are of the same rarity, but look a little different. 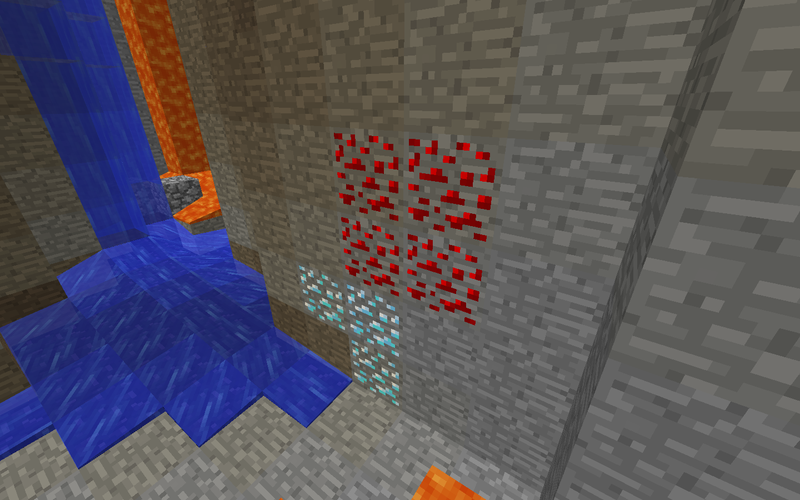 Multiple drops come from these compressed ores. Diamond, emerald, and gold ore drop 2-3 per ore. redstone drops 10, lapis drops plenty as well. This level is about 100 blocks. The bedrock planes level is an open, flat area of bedrock with no ores. There is a low roof of bedrock about 20 blocks above you. Instead of pools of lava, there are entire lakes of a similar substance. Molten iron. If water is poured onto it, the water disappears in a puff of smoke. If you jump in, it kills you in about 2 seconds, but it can be collected with a special type of bucket. This doesn't have much use, but has incredibly long smelting time. Sometimes, you might come across a piece of bedrock that looks a little broken. It's called fragmented bedrock, and can collected with an ametrine tipped diamond pickaxe. Fragmented bedrock cannot be used in any swords or tools, but cannot be blown up or broken by the wither. 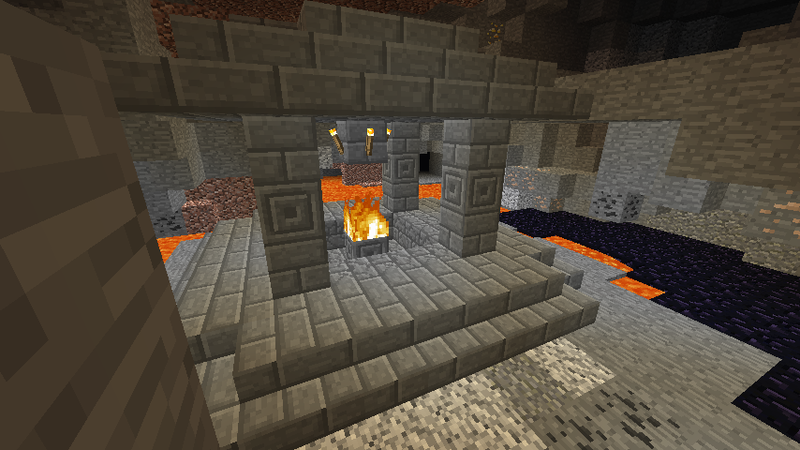 There is also the fragmented bedrock bucket, which can hold molten iron. The molten iron, besides the smelting time, is a trophy representing the skilled caver. This level stretches about 100 blocks. This place seems like the normal caves, but there are traces of netherack, and you can hear the sounds of the nether nearby. You may here the sound of a blaze or screams in the distance, but wherever you mine, you will find nothing. There also may be a few quartz lying around. This level lasts for about 100 blocks. 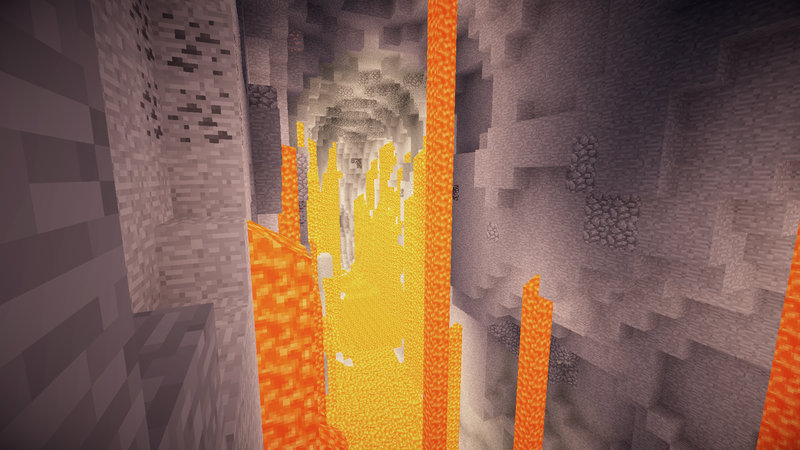 This level is made up of giant lava falls and cobblestone, lighting up the caves like a flame in the dark. 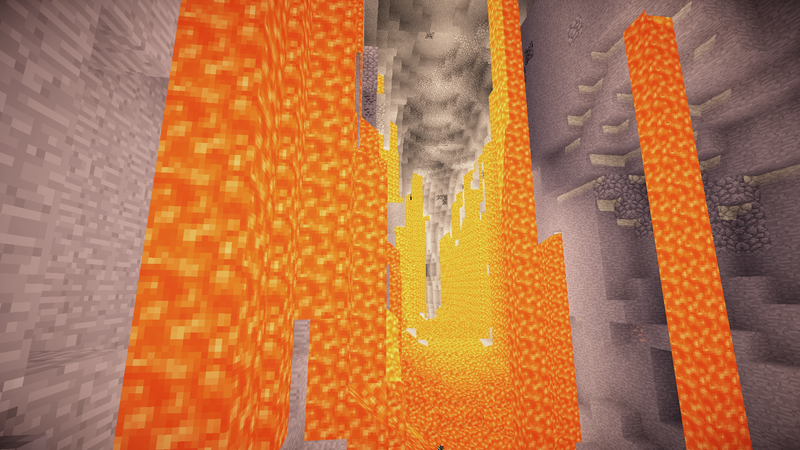 This level stretches down for about 50 blocks, and looks like a giant ravine. There are still a few traces of bedrock on the walls. This level is a jaw dropping hole in the minecraft world, a rip in the fabric of the gaming universe. The void is not present here, but has started to “Infect” this level, and there is a weak effect of the void here, around half a heart every 10 seconds. The best and safest way to pass this level would be with a bucket of water and a golden apple. This level lasts about 100 blocks. 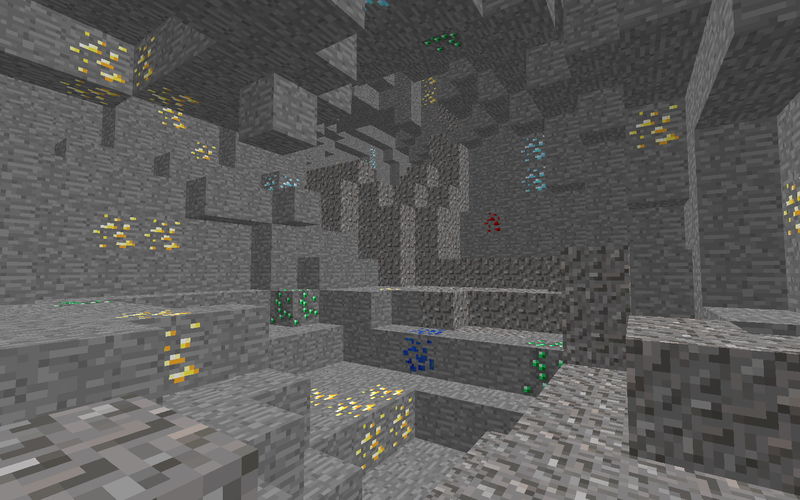 On this level, all ores are twice as common. They are almost everywhere. But the mobs here are twice as powerful. They have more health, and more armor, but nothing else. This dangerous level lasts for around 75 blocks. When you get to this level, everything goes eerily quiet. You can place torches, but they emit less light than usual. The caves slope down, curving into an even darker area, which keeps on descending. Night vision potions do not work in this area. There are also new blocks, like dark stone, which takes longer to collect than normal. This level goes for a whopping 250 blocks, convincing the player to turn back and give up. 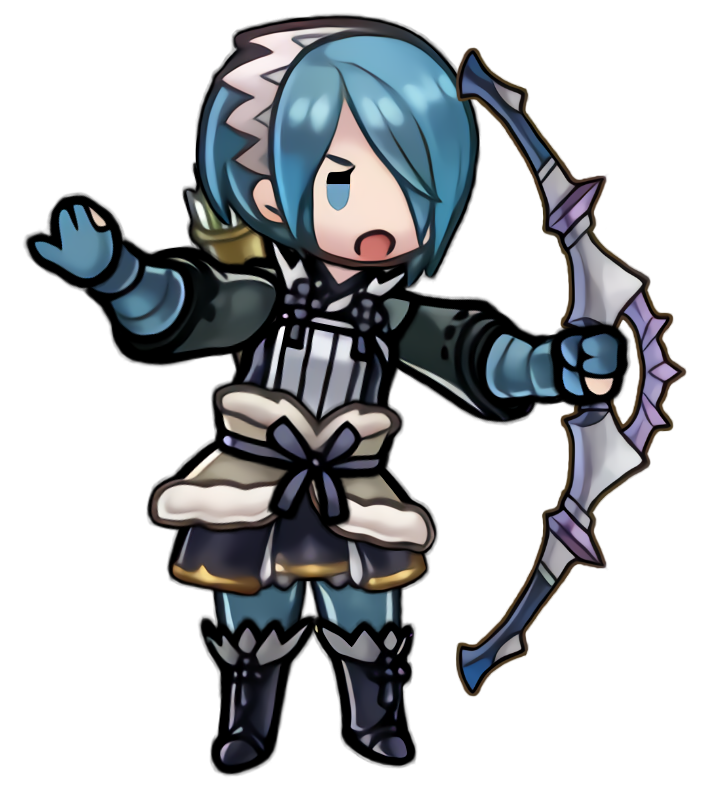 If the player has been brave and patient enough, they will receive a reward. Light will begin to shine around the corners. They will encounter the cave villages, an incredibly large network of underground homes, all abandoned. Most chests are empty, but some may have useful loot. This place looks like it was left in a hurry. The caves continue to lower villages, which eventually continue farther underground. This level is about 100 blocks. As you continue down, you get to an area blocked off by iron bars and wood. This was obviously placed by the cave villagers, but why? This is why they left. 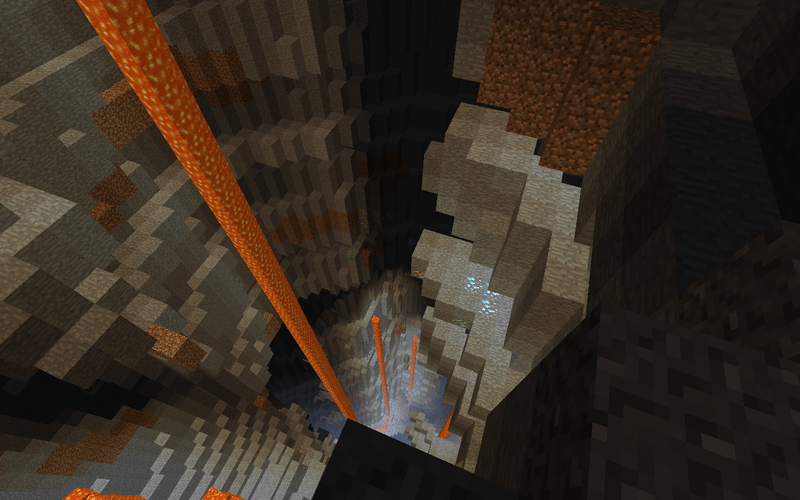 If you jump through a portal, you will encounter giant ravines of "mutated" mobs. These mobs are more hostile than usual, and have buffed health as well as speed. Creepers will explode in a slightly larger radius. There are waterfalls of a poisonous, green substance that will kill you if you touch it. This level lasts another 100 blocks. This is the level below the void. The secret to get here is to drop from a point where x and z can both be divided by 100, and stay in the shaft of light. You will then get the building terrain screen. Below is the forgotten level. This level is pitch black, and the only mobs that spawn are the shadows. 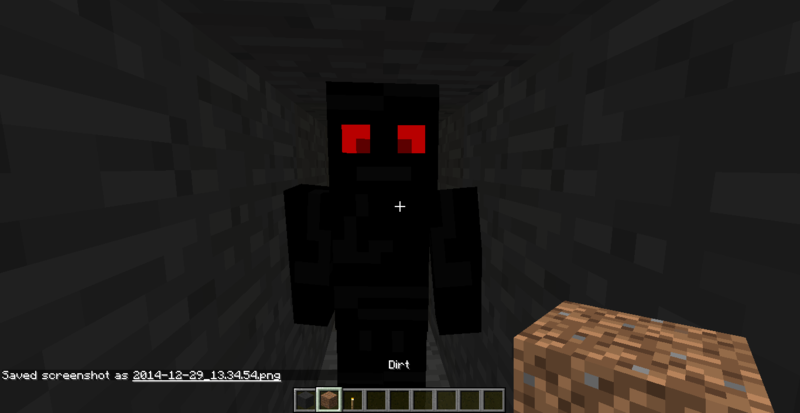 The shadows are like normal mobs, but they are completely black with glowing red eyes (Almost like they’re not there). If any of them attack you, you get the blindness effect. At day, the shadow mobs hid. Hurry through, the shadow mobs will come in giant waves of attacks at night, which will surely kill you. This level is around 230 blocks deep. There are only two new blocks on this level. There’s fragmented cobblestone, and also there’s soul obsidian, said to contain the crying spirits of victims who had fallen into the void. It’s slightly easier to mine than normal obsidian. It has a 2 out of 3 chance dropping normal obsidian, and a 1 out of 3 chance of poisoning you for 20 seconds. This level is about 70 blocks. This is my idea. I spent quite a while on this, so I would greatly appreciate constructive feedback on what sounds like a good idea. Also, any pictures on what it could look like will be put in the picture gallery. If they seem good enough and you want them in there, they will be put in there. A banner for this would be amazing. Anyone who has supported so far! Thanks for 10000 views and 150+ supporters!!! Hm... Interesting. I'll have my eye on this thread. It's pretty good, wasn't too sure when I heard new ores, but I think it's all great! One thing though, rubies were originally going to be added for villager trades, but was switched to emeralds because one of the Mojang staff members was colorblind, and had a hard time telling the difference between rubies and redstone, so you might want to change rubies onto another ore. I'll think of something else... it still has to seem greedy though. I'll go with something purple. Ametrine is a mixture of amethyst and citrine. I thought it would be better because no one else has used it yet. Also, I'm going on a long car trip, so I won't be able to talk to anyone until tomorrow. I'll answer other questions then. Awesome! this would be good for the game. He's not suggesting cubic chunks, though, he's suggesting deeper caves. The way it renders, if it's a problem could just render one level of cave at a time, so going to the deeper caves will unload the upper caves. I have to say that I'm meh about this idea, even if it is about more/bigger/deeper caves, as I experimented with making the ground deeper myself, raising sea level by 64-128 blocks (same world height limit, meaning the highest mountains nearly reached it, this before 1.7 made them taller) - but the caves become so insanely enormous, with even the average cave system being larger than anything in vanilla, that I found it a bit too much (which is saying a lot if you've seen my posts about how many caves I've explored and how fast I can explore them). Granted, this allowed awesome formations like 200 block deep ravines (and a much greater variation in their size, I didn't have all of them be that deep, some even smaller than they currently are). In fact, I only see it being really practical if the ground was split into 64 block deep layers, with each layer being like the current Overworld (i.e. ores and caves are distributed normally over each set of 64 layers, with some separation between layers, minus bedrock except for the lowest layer, and some caves connecting them; the uppermost 64 layers of ground and above sea level would have the same ore/cave distribution as the current world generation), and that is really just like stacking several worlds on top of each other. 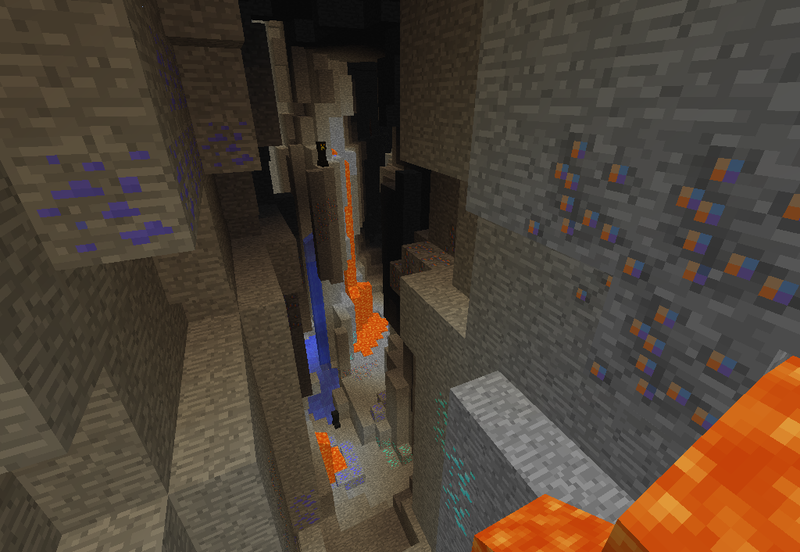 A more minor tweak would be to remove the upper layers of bedrock and lower the levels of rare ores and caves (including the lava level) by 5 blocks, which would give you about 10% more explorable caves (there would be less diamond and redstone in particular but that doesn't matter since the concentration is the same; a branch mine at y=6 would have the same yield as a current world at y=11). If applied to current world generation, it would also reduce the amount of obnoxious (to some people) cave/ravine openings at the surface as cave density rapidly drops off as you go up. Of course, before even making such changes they need to add in customization of caves, so you can get the Swiss cheese that the game generated until 1.7, or anything in between and more. (at the least, the size of cave systems and their frequency, also the height range caves generate over and their width. Similarly, ravine frequency, size, and height range could be added). I support, but the only problem is that ametrine is waaaaaaaaaaaay too rare I would 100% support if the ametrine was a Bit more common. Ametrine is so rare just so it doesn't get abused or farmed, maybe I could add another ore with a little more use. Thanks to whoever has given any support so far! Okay, how about 1:10 instead? Thanks! I'll see if I can think of anything else to add! Sure, I'll see what I can come up with! Anything you were thinking of in particular? So it's just another version of my suggestion Terrain changes in an infinite high map. It's not too bad. I just think that the blocks shouldn't affect weather. I think I'll change that. And yes. This is just basically with more variety. Far-void level: just like the Near-Void level, but the void damage cannot be blocked, this level goes down... down... down... until anywhere minecraft can keep the world existing, just like the regular vanilla void... well at least we think, no one was brave enough to pass this level and survived to tell... so far, but there may be more unknown and unexplored levels... who knows? blocks can still be placed here! The only thing know about passing through this level is a phrase said by an ancient race: "at the middle of this world, light goes on"
EDIT: ok, i'll reveal what the phrase means: if you go to positions X=0, Z=0 and dig straight down until you reach that level, you can jump (as long as you are touching the daylight and it's daytime) (duh), you won't take void damage or fall damage, so you can just jump in there, then, about ~500 blocks of fall, you'll reach the next layer, there, you won't need the daylight to not be killed, BUT you'll need to stay near a light source or darkness will consume you! the next level is the forgotten level, it have 228 blocks there's no light there, no blocks that generate light spawn in there and it's way too deep to just mine up and take some daylight (except for the one you used to pass the far void level) so you MUST bring torches or you'll begin being consumed by the darkness in 15 minutes, when you reach the last block of the far void level, you'll recieve a potion effect called "darkness protection" that lasts 15 minutes, when you're anywhere with a light level greater than 0, this effect will be instantly triggered again for 15 minutes (if you drink milk, this effect will not be removed), if the effect finishes, then, you'll take void damage, that can't be blocked by anything, not even resistance effect that deals half heart damage each half second (you die in 10s) and your health regeneration will be blocked and you'll be blind! 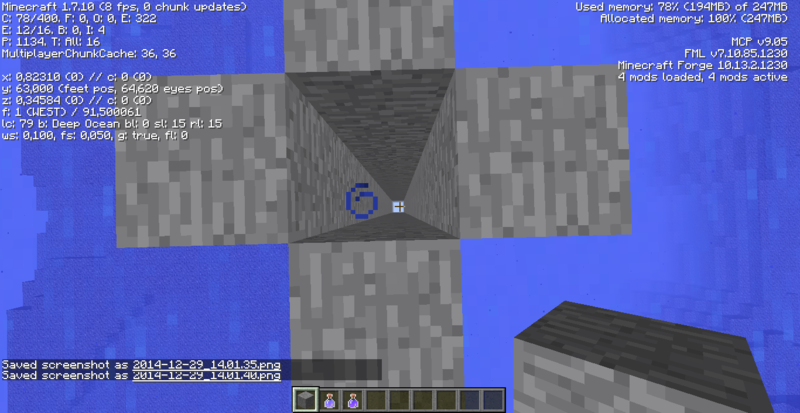 in this level, only hostile mobs can spawn, there are new hostile mobs, they are MUCH stronger than the regular mobs, only coal ore and cobblestone generate here, if the player put a water block here, the water will be corruped and will cause wither II effect, the effect last until you get out of the water. 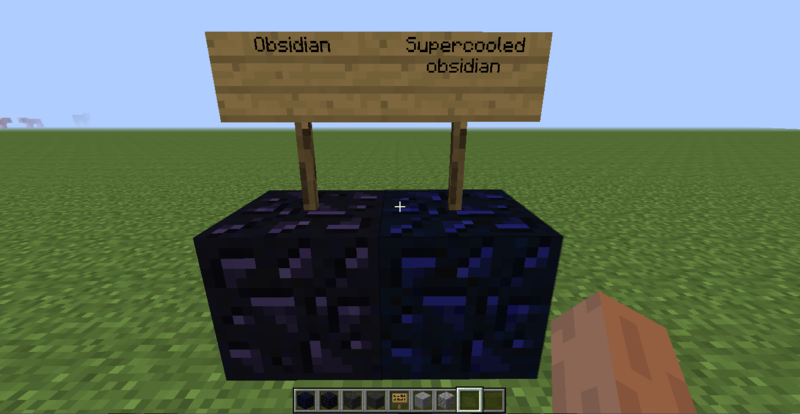 Then, we have the evil level, it's just like the forgotten level, but there's no coal there, only two new blocks: "cracked cobblestone" and "crying obsidian" (crying obsidian can be mined for easy obsidian blocks as it's weaker and drop obsidian if not mined with a silk-touch pickaxe) no regular mobs spawn here, this level is scary! even if you are not scared easily, this level WILL scare you! no one "except the new mobs" ever explored this place! not even herobrine would be brave enough to stay here! 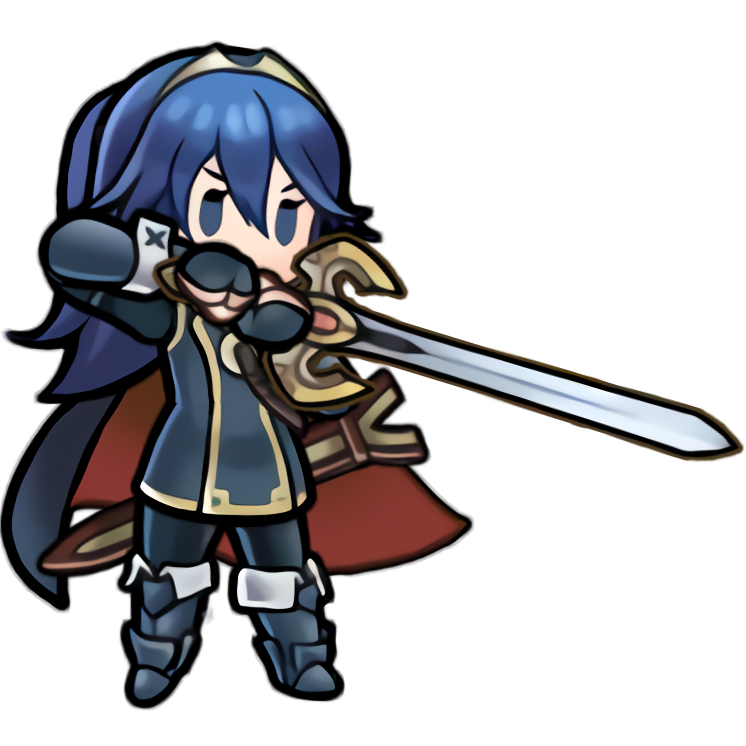 here, the darkness protection effect lasts only 10 minutes if you stay near a light source with light level of at least 5! this level have 66 blocks. Then, the REAL last level is the darkness maze, no living being have EVER visited this place! only bedrock blocks are here... they are formed just like a 3D maze "this time it's literally a maze" there's almost no space to walk, the player have to walk through the maze and then, find a hole to go a layer down, the maze have 20 layers each layer have 5 blocks, the darkness protection effect last only 8 minutes and have to be replenished with a light level of at least 12! in the very last layer, it's not a maze but a flat place, no walls, at every 100 blocks ([x0;z0], [x-100;z0],[x100;z0], [x-100;z-100] and so on, the player will find a chest, the chest contain a pickaxe that can mine bedrock (have only 99 uses, takes 10 seconds to mine bedrock), a new block, and above the chest there's a trophy block that drop a trophy item when mined, when placed, it have a cobblestone-like texture and it's written: "congratulations! you have proven to be the best miner in the world!"